PT Astra Honda Motor - PT AHM or known as AHM is a reputable foreign investment company in Indonesia that is involved in automotive industry. PT Astra Honda Motor has principal business in motorcycle industry. AHM engaged in manufacturing, distributing and marketing of Honda Motorcycles for the domestic market and export market. PT Astra Honda Motor is a multinational joint venture company between Indonesia PT Astra International Tbk with Japan Honda Motor Co Ltd. PT Astra Honda Motor is 50% owned by PT Astra International Tbk and 50% by Honda Motor Co Ltd. AHM was first established in 1971 and initially registered as PT Federal Motor. In 2000, Astra Group restructured its motorcycle business by merging PT Federal Motor and PT Honda Federal into PT Astra Honda Motor. 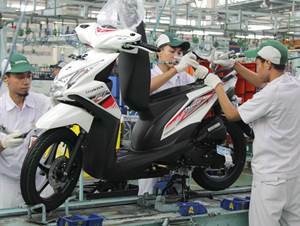 According to information found in AHM's website as cited by JobsCDC.com, PT Astra Honda Motor now has installed total annual production capacity of 5.8 million units. Based in Jakarta, AHM now has 4 production facilities. Its first plant is located in Sunter Jakarta. AHM's Sunter plant operates as Assembly Plant and Head Office. AHM's second plant is located in Pegangsaan Jakarta (Assembly Plant). AHM's third plant is located in MM 2100 West Cikarang Bekasi (Assembly Plant). AHM's newest plant is located in Karawang for Assembly Plant and Part Centre. AHM also supported by Astra Honda Training Centre Sunter. Age around 18-20 years old. Education background in Senior High School or equivalent (SMA/SMK), majoring in IPA, Engineering and Automotive. Have minimum mathematics score in per semester of 6.00. Minimum height of 163 cm. Not color blind and not glasses. JobsCDC.com now available on android device. Download now on Google Play here. Please be aware of recruitment fraud. The entire stage of this selection process is free of charge. 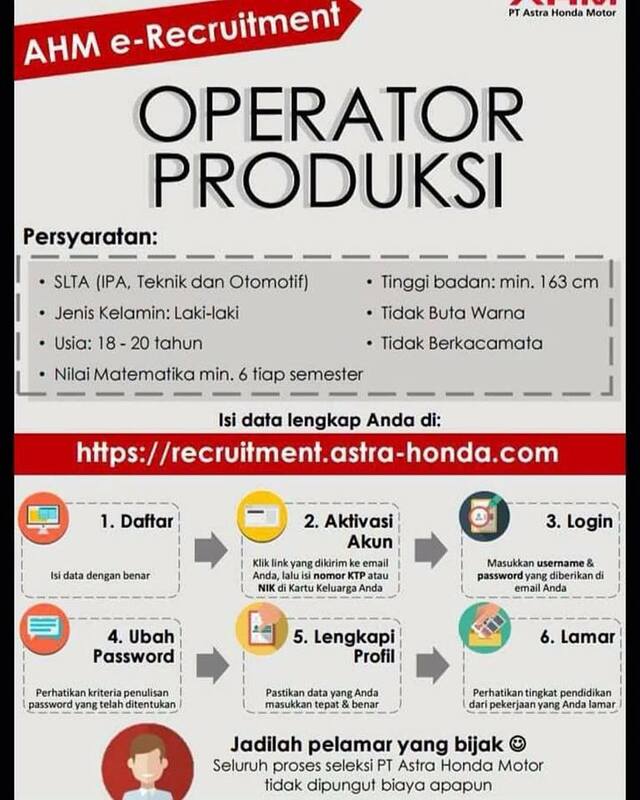 PT Astra Honda Motor - Production Operator AHM Astra Group February 2018 will never ask for fees or upfront payments for any purposes during the recruitment process such as transportation and accommodation.